Android's stock homescreen is fine; usable, not thrilling. SlideScreen, a homescreen replacement, is a wild departure that totally changes how you use your phone. It's a mix between Zune, MotoBlur and HTC's Sense. And I just made it my default. 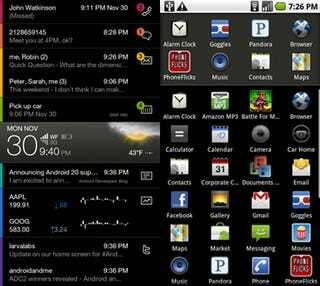 Instead of the standard grid of icons and widgets we've seen in handhelds since Palm OS, SlideScreen integrates information from various sources—Google Reader, Twitter, email, text messages, calendar appointments, and stocks—right onto the homescreen. It's sort of like Blur, the social-networking-focused Motorola skin seen on the Cliq, taken to an extreme. Each of these information sources is given a color-coded section and shows new information as it comes in. In the middle of that is the app's namesake, a slider (itself displaying date, time, weather, battery, and signal strength) that can be moved up and down to reveal and highlight each of the other sections in full. Tapping the menu button takes you to a traditional list of apps, with space for eight favorites at the top. It's pretty confusing to explain, but it's really easy to use. Check out this video for a nice walkthrough. I love how the app frees you from the standard homescreen. No longer does your home button lead you to a portal for opening other apps; SlideScreen gives you access to the information within the apps that you want. Tapping on any individual update, like a tweet or an email, takes you into the corresponding app (in this case, it might be Twidroid and Gmail), but you can just look at the homescreen and get the gist of what's happening in your phone. It's also incredibly fast—even on my Droid, which is a pretty swift little bugger, the stock app launcher and notification shade both have a tendency to stutter, but SlideScreen is perfectly smooth. That's not to say that it's perfect, however. SlideScreen is not very customizable—I'd love to be able to move or add some sections (right now, you can only remove them). I want to add Facebook/AIM/Gtalk, or put my email in the top position instead of phone calls, but no such luck. Also, it doesn't work with Google Apps (only normal Gmail accounts work), so my Gizmodo email account doesn't show up on the homescreen—a serious problem. Luckily the SlideScreen team says they're working hard on releasing a fix for that issue. The built-in Twitter reader is very barebones, and displays only an excerpt on the homescreen (an excerpt of a tweet? Is 140 characters really too long?). But it's got a ton of potential, and it's interesting to look at, which stock Android is not, particularly.